Haha *snort! * That’s a great one. They actually have a crossing pole in the middle of a field. Is there even a traffic light there?! i guess someone REALLY wanted modern technology (snort) and just had no where to put it! my question is–is the button hoof friendly or does it totally oppress the four legged society which the corn would show to be a major political force in this community?? Clearly the Corn is on the move. The real question is why? Why do they want to cross the road? I don’t think “To get to the other side” is going to cut it this election season. 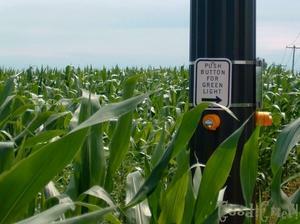 Is this Christian fundamentalist rural PA corn moving in on the liberal suburbs of Philadelphia? God forbid, is this Islamo-fascist corn? Are they moving on the Conventions? And just why don’t we have any good intelligence on this anyway? Maybe….oh my God….there’s Cheney’s face just to the right of the pole….this is Halliburton corn!